Nixon was the only President to resign in disgrace. His crime was his involvement in the Watergate break-in and coverup. During his administration he established relations with Communist China and extracted the United States from Vietnam. Richard Nixon was born in Yorba Linda, California. Nixon grew up among the poverty of the Yorba Linda. Twice he nearly died, once from an accident and once from pneumonia. During the time when the Teapot Dome Scandal became public he told his mother one day:" I would like to become a lawyer an honest lawyer who can't be bought by the crooks.". The most traumatic event of his childhood was the death of is brother Harold from tuberculosis. Nixon was educated in public schools. He entered Fullerton High schools, and in his junior year he transferred to Whittier High School in 1930. He graduated near the top of his class. Nixon attended Whittier College from 1930-1934, graduating second in a class of 85. He was President of the Student body. He went on to Duke University Law School on scholarship. He graduated in 1937 second in the class of 37. He was admitted to the California Bar the same year. 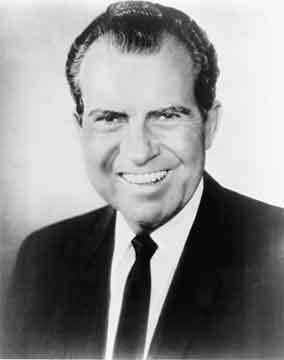 Nixon practiced Law in Whittier after being admitted to the Bar. In 1940 he became involved in forming a company to manufacture frozen orange juice. The business failed within two years. In 1942 Nixon joined the navy. He rose from lieutenant junior grade to lieutenant commander, he served in Pacific, primarily in Logistics. In 1946 Nixon ran to become the US representative from California's twelfth Congressional District (Whittier and parts of Los Angeles). He defeated the five time incumbent Democratic Representative Jerry Voorhis. Nixon helped draft the Taft-Harley act. Nixon emerged as a national figure due to his position as Chairman of the House Un-American Activities Special Subcommittee to investigate whether government officials were former Communists. This became known as the Alger Hiss case. In 1950 Nixon was elected to the US Senate. He won his candidate partly because of his attacks on his opponent of Helen Douglas claiming that her voting record in the House corresponded with the goals of the communist party. In 1952 Nixon was nominated to become the Vice Presidential candidate. During the campaign he was accused of having a slush fund. Eisenhower said that he would keep Nixon on the ticket only if he were able to clear himself. Nixon went on TV and admitted that he had the fund but that it was not for personal use, but for political use. In the end of the speech he admitted that he had received one present, a dog named checkers for his daughter, and that he would not return. This speech which became known as the Checkers speech, and received a very favorable reaction from the public and he remained on the ticket. Nixon presided over cabinet meetings when Eisenhower was away and when he was sick. Nixon travelled extensively engaging in the famous kitchen debate with Khrushchev at the US exhibition in Moscow. Nixon lost a close election to John F. Kennedy in 1960. He then lost an election for Governor of California in 1962. His opponent was incumbent governor Edmund Brown. After his defeat he gave a press conference in which he states " you won't have Nixon to kick around anymore, because, gentlemen, this is my last press conference". For the next six years Nixon worked for a new York law firm, and campaigned for Republicans throughout the country. President Nixon's initial major foreign policy focus was on ending the War in Vietnam. He followed a dual track, on one hand decreasing direct American involvement in the fighting by Vietnamization- turning over more and more of the ground fighting directly to the Vietnamese. Simultaneously the fighting was expanded to neighboring Cambodia to destroy North Vietnamese sanctuaries. Many of Nixon's actions especially his attack into Cambodia met with violent protest. After his attack on Cambodia the demonstration included ones at Kent State University in which 4 students were killed by the National guard. While the war was going on Nixon's national security advisor Henry Kissinger was involved in negotiations to end the war. In January 1973 the United States and North Vietnam signed a peace treaty. Under whose terms there was a cease-fire, return of American prisoners of war, continued presence of US civilian advisors, and a process toward reaching a final peace agreement. The peace failed and during the Ford Presidency the North conquered the South. Nixon pursued two major and related foreign policy objectives while President. He pioneered the opening of American relations with China. This effort culminated in a visit that he undertook to China in February 1972. Simultaneously Nixon pursued a policy that called detente with the Soviet Union. This was a policy that was designed to find ways despite the difference between the United States and the Soviets to work together to reduce tension and coexist. The high point in the detente process was the signing of the SALT I (Strategic Arms Limitation Talks) treaty during Nixon's visit to Moscow in May 1972. Nixon's most notable domestic action were economic. In 1971 Nixon imposed a wage price freeze to combat inflation. Simultaneously he removed the United States from the gold standard. The freeze was removed after 90 days to be replaced by complex system of wage price controls. Almost all controls were removed by the end of 1973. Nixon will go down in history as the first President to resign from office. His resignation was after a prolonged cover-up of the what became known as the Watergate scandal. The scandal began when members of the Nixon reelection committee were caught in a breaking at the offices of the democratic party in the Watergate building. The crisis slowly deepened as when President Nixon tried to cover up the involvement of his staff in the break-in. During the investigation it became known that Nixon had made tapes of all his conversations and telephone calls. These became key items of evidence, and when the House drew up Articles of Impeachment, Nixon decided to resign instead of being impeached. First President to visit China. First President to nominate a Vice President under the 25th Amendment.